Hello everyone! 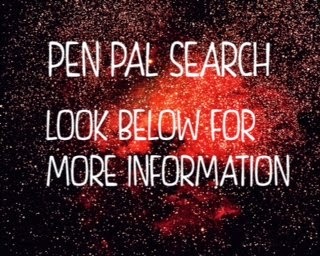 If you follow me on Instagram, then you know that I am currently looking for a penpal. But first, let me explain the two days in a row posting thing I've got going on. I'm gonna share my schedule at the end of the post so stay tuned. So I've been blog searching lately, binge-reading (is that a thing? WELL IT IS NOW. the reading version of binge-watching.) some select blogs. Uhm, #stalker. ANYWAYS, I noticed a lot of bloggers have super cool pen pals and I was like: I WANT ONEEEE. so I am having a contest, yay. So, uhm, how do I enter? It's simple! All you gotta do is email me, filling out this simple form. You can write it in the comments and let me know if you don't want it to be published. 4.Do you live in the US? 6.Have we ever chatted via email/comments? Okay, what are the rules? -You have to be willing to give me your address and agree to not tell anyone mine. That's it! I'm really looking forward to having a pen pal! Thanks so much guys. The contest ends FEBRUARY 28. (normal post on Monday) IF I DON'T GET ANY ENTRIES, I'LL CHANGE IT TO VIA EMAIL. Although, via letters would be much more fun. I would love to be your pen pal! But, I'm not ok with giving out my address, so I can't. I hope that you have a fun time exchanging letters with your pen pal when you get one. I'm 14 years old, turning 15 in November! I do live in America, in Louisville Kentucky to be exact! Do we have anything in common...huh....we both like to blog! I'm pretty sure we both love to read, and I guess we are both smart, in my not so modest opinion (Dumbledore quote!) I didn't skip a grade but I did have to go to a school with an accelerated when I was in 4th and 5th grade, and I haven't stopped there! And lastly, I prefer the term nerd, or expert, to fangirl. XD I love Harry Potter, Adventure Time and Disney! I have also read many of the popular things to read these days like Hunger Games, Divergent, TFIOS, ya know the deal, but Harry Potter really is my strong point. I'd love to start chatting with you :) And I don't really care if you want to publish my comment then go right ahead! Oh yeah, I have a little sister who is 10 years old and she has been dying to start a blog too but I don't think she's reached that point of writing yet. I find your writing style really mature! And I hope my sister can be inspired by you. I would love to!! I'll write soon... it's supper time.